The Stormlight Archive is a Must-Read for Game of Thrones Fans | Nerd Much? If you’re a Game of Thrones fan, you’ve probably heard the news that you’ll have to wait until 2019 for the show’s final season. And if you’re a fan of the books…well, let’s not talk about THAT wait. Lucky for you, though, there’s The Stormlight Archive. The show’s source material, A Song of Ice and Fire, is a good place to start if you’ve never read it. George R.R. Martin has written five novels of a planned seven, so you have plenty of time before season 8 to catch up on the books. Or, you could read something different that somewhat feels like a book series like Game of Thrones. It’s certainly epic. It’s long—at three books so far (of a planned ten), it stands at 1.27 million words (compared to A Song of Ice and Fire’s 1.84 million words). 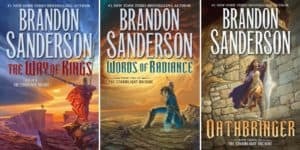 Brandon Sanderson is a writing machine (fans fondly call him “The Sanderbot”) and plans on releasing a Stormlight Archive book every three to four years. So What is The Stormlight Archive Exactly? Most fantasy books are based on a “what if” concept or are set in a world with one defining characteristic. 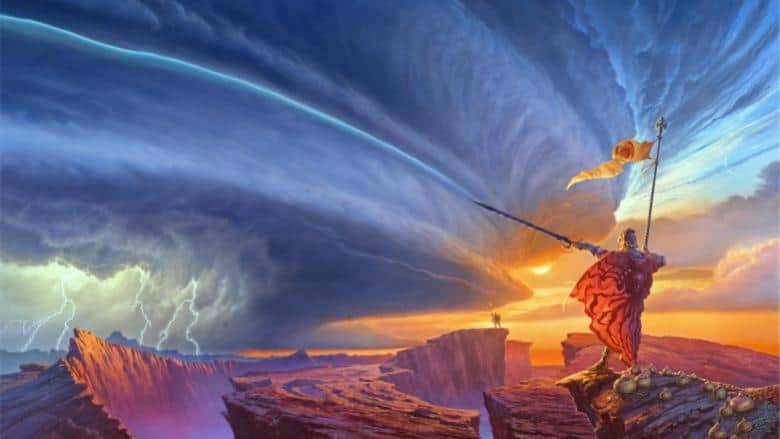 The Stormlight Archive reads as if the core ideas of ten different fantasy worlds have been masterfully blended into one vibrant setting. The first book in the series, The Way of Kings, is long, and so are the other two books. But think of each book as a trilogy—that’s how the author structures them, and it really feels like you’re reading several books woven together. On the world of Roshar, a hurricane-like storm sweeps over the rocky world every few days. Civilization, flora, and fauna have all adapted to this extreme environment. With the powerful storm comes stormlight, an energy that can be used to infuse gemstones, the world’s primary currency, and produce light and even energy. The people of Roshar are diverse and unusual (the Thaylen have distinctive long eyebrows, and the Iriali are known for their golden hair), and the world is filled with rich cultures with deep histories. Societies are often divided into two groups of people: the lesser darkeyes and the privileged lighteyes. On top of all this, there’s also spren, which are sentient, spirit-like beings who are attracted to certain human emotions. There’s angerspren, gloryspren, keenspren—no one is certain how many varieties exist. Though they’re magical to read about, these tiny beings are commonplace in Roshar. Oh, and there’s also shardblades, ancient swords that can be summoned by their wielders and have the power to cut through stone and souls. The series follows several characters and their adventures: Kaladin, the darkeyed spearman who has seen his comrades fall and finds himself a slave. Shallan, the ambitious scholar with a lot of dark family secrets. Dalinar, the aged warmonger who now watches his country squabble in a pointless fight against the Parshendi (more on them later). Szeth, the Assassin in White, who is forced to kill kings against his will. And yes, that is the shortest summary of this series I could come up with. Why is This the Perfect Series for Game of Thrones Fans? I think this is a series for fans of fantasy in general. But for fans of George R. R. Martin’s world and characters, this series offers some similar elements while being something very fresh and unusual. Michael Whelan’s cover art for The Way of Kings, from Brandon Sanderson’s website. George R. R. Martin is known for his worldbuilding—we know thousands of years of Westeros’s history and lore. But Brandon Sanderson takes worldbuilding to a different level. The Stormlight Archive is intricate without ever being confusing or info-dumpy. Though much of its ideas are new and unusual, they’re introduced slowly and in a way that makes sense—as a result, rereading is a blast. It’s like a treasure hunt filled with morsels of lore and magic. One way that Sanderson succeeds in making the world feel massive and heavily populated is through interludes. This isn’t a series about traveling the world, so we mostly get a look at two or three places in each book. Sanderson cleverly uses the interludes, which are essentially short stories following non-protagonists in Roshar, to give us a look at some of the other cultures and places of the world. These add a lovely bit of flavor to the world, and they’re just good stories. 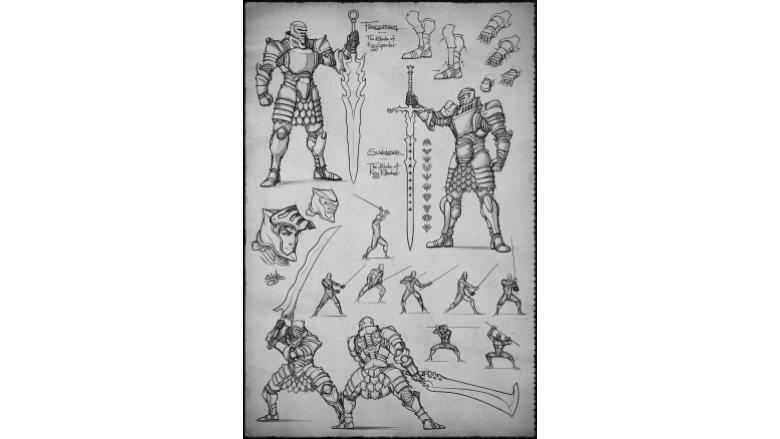 Each Stormlight book is also filled with dozens of pieces of artwork, all of which are intended as “in-world” pieces of art created by the scientists, religious leaders, and historians of Roshar. 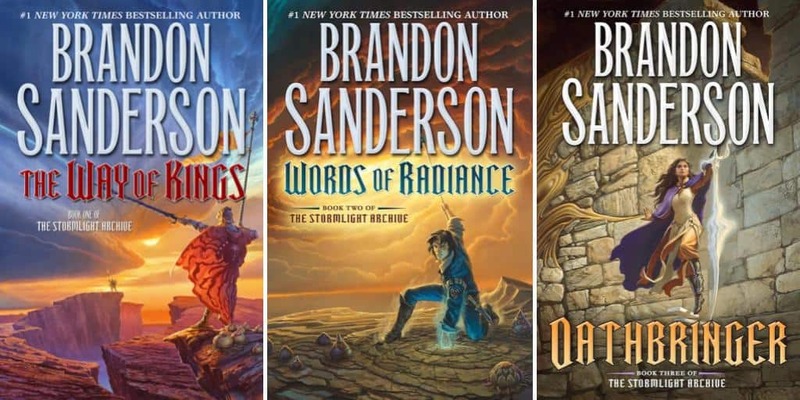 And speaking of worldbuilding, you could even call Sanderson a “universebuilder.” Most of his novels are set in “The Cosmere,” a collection of magical worlds, and there are a few crossovers from other series in Stormlight. It’s wonderful. 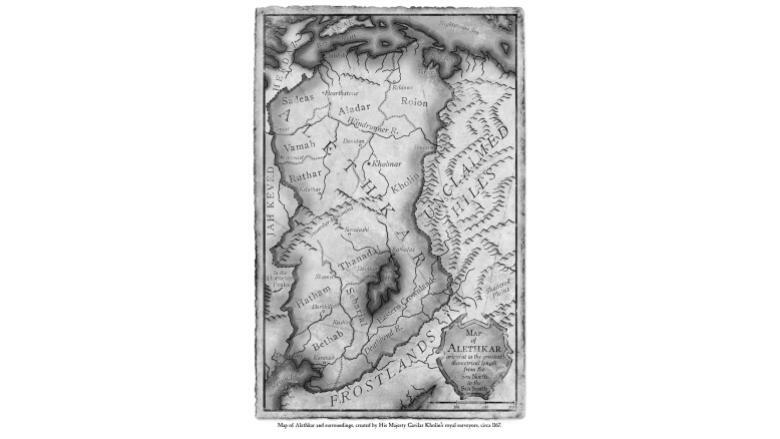 Map of Alethkar from Brandon Sanderson’s Website. While Stormlight isn’t nearly as stabby and schemey as GoT, there is a very healthy dollop of political intrigue, particularly in the first book. Alethkar, the country at the story’s center, is in a fragile state. For the past six years, the ten princedoms have been fighting the Parshendi at the Shattered Plains. The Parshendi are a people with marbled skin covered in carapace, and they are believed to be responsible for having King Galivar (Dalinar’s brother) assassinated. Though the Alethi fight a single foe, they also compete with one another to win gemhearts (big magic stones that absorb stormlight) in battles against the Parshendi. Dalinar is a prominent figure as one of the more powerful highprinces, but his influence is waning, and everyone is beginning to doubt his sanity. Even himself. Meanwhile, his nephew Elhokar is not doing very well as the new king. And Elhokar is extremely paranoid about assassination attempts. Maybe because the world’s leaders are being eliminated by The Assassin in White. Okay, so it’s definitely stabby. There aren’t quite as many characters to keep track of as in GoT, but the political players of Alethkar are conniving, often cowardly, and always greedy. 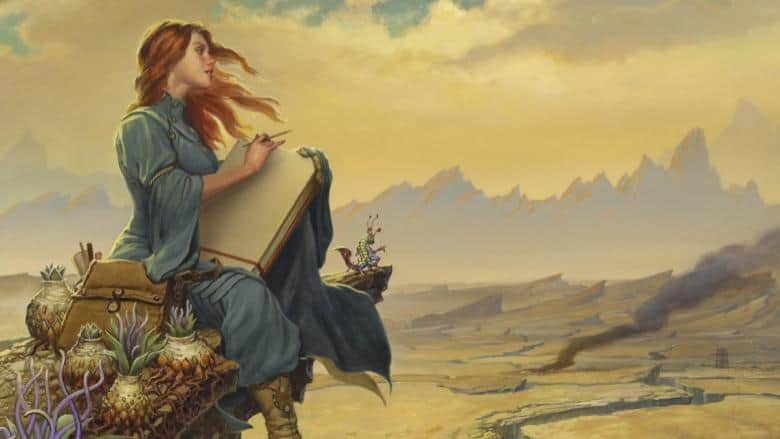 Michael Whelan’s illustration of Shallan, from Brandon Sanderson’s website. Featuring a much smaller point-of-view cast than Game of Thrones (and a much-less-likely-to-be-killed-off cast), Stormlight has some truly wonderful characters. Each of the ten books will focus on one character and their backstory. In the first book, we get a close look at Kaladin and a lot of flashbacks that explain some of his hatred of lighteyes. Kaladin’s arc is a great exploration of the issues people with serious depression face. Without revealing too much, I’ll say that Shallan Davar’s character is one that is always more complex than you think. She is an expert at appearing like someone who she isn’t, which results in a lot of her past being hidden from those she is closest to. Then there’s Dalinar Kholin, who is my favorite fictional character. He’s wonderfully flawed—one moment he’ll make you put the book down and cheer, and the next he’ll make an incredibly stupid and short-sighted decision. But I enjoy reading about him the whole time. Szeth-son-son-Vallano, the Assassin in White, lives a conflicted life. It’s hard to say too much about him without spoiling anything, but I’ll say that I like Szeth a lot, and I feel really bad for him. On top of these guys and gals, there’s the brilliant Jasnah Kholin (Elhokar’s sister), Dalinar’s sons Adolin and Renarin, and an entire cast of characters who Kaladin meets at the Shattered Plains. There are a lot of people to remember, but Sanderson does a great job of reminding you who’s who through context clues, and I never felt the need to take notes (unlike with GoT). Game of Thrones has always been known for some truly shocking moments, but the plot of Stormlight can be just as intense and jaw-dropping, if not moreso. Sanderson is known for a plotting style that many call “The Sanderlanche.” The Way of Kings is a slow burn for sure, but it’s building to something big, I promise. It’s a long book (though not as long as its sequels), but it also has 300 pages of climax. So if you find yourself at the end of part 3, don’t keep reading unless you have nothing going on for the next six hours. And don’t get me started on the plot twists and mega-climax of the second book. Or the third. Sanderson knows how to deliver. And none of the Stormlight books end on huge cliffhangers, so you can sleep at night. Unlike some other books. Shardblades and shardplate in action, from Brandon Sanderson’s website. While magic plays a big role in Game of Thrones, Stormlight is positively packed with it—I mean, their currency is literally powered by magic storm energy. You’re probably getting a sense by now that Brandon Sanderson is known for many things. Well, another distinctive touch of his is elaborate and almost scientific magic systems. Most Sanderson books have an Ars Arcanum at the back which explains just how things work. His magic always has rules so that—unlike in GoT—you understand exactly why things happen the way they do when magic is involved. A big part of Stormlight’s lore is the Knights Radiant, an ancient order of men and women who wielded shardblades and had incredible magic abilities. They protected Roshar during the Desolations (apocalypses, basically)—until the day when they all turned their backs on the world and vanished. I won’t give anything away, but this is a ten-book-long epic fantasy series filled with magic and dramatic moments, and there’s a chance we’ll see some Knights Radiant in these books. Maybe. Who knows how many books he’ll write before Stormlight #4? Oh wait, I do—seven. And those other books he wrote in between? They’re outstanding. Sanderson has always been very open with his fans about his writing progress. He has a progress tracker on his website, for crying out loud. And he is usually pretty close to his estimated release dates, because he’s been at this for a while. Well, not really since his first book was published in 2005, but considering that he’s published over 25 books since then, it’s safe to say that this magical man can write fast. My point is that you won’t be waiting too long between Stormlight books if you decide to dive into this sprawling series. And during the wait, you can read his other incredible works, many of which are linked through the Cosmere. Or, of course, you can finish reading A Song of Ice and Fire or watch the final season of Game of Thrones, because it will probably take you a serious chunk of time to read all 1.27 million words of The Stormlight Archive. Stormlight is without a doubt the biggest fantasy series at the moment. The second and third books both debuted at #1 on the New York Times Hardcover Fiction Bestsellers List, and the books are set to be adapted for film. There’s a lot of conversation about the series so far, and this is a great time to jump in. By the time Game of Thrones is wrapped up, people will need something to fill the void. Why not the magnum opus of one of today’s greatest fantasy authors?